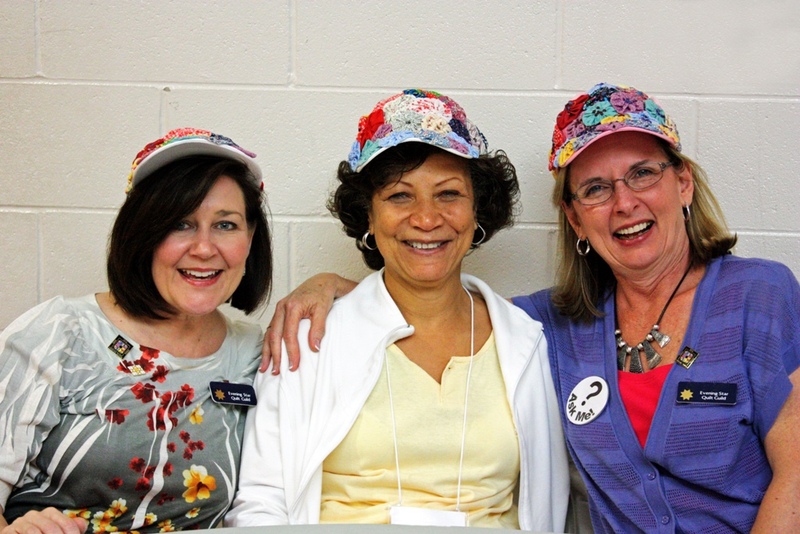 I've almost recovered from the Quilt Symposium of Alabama. I should probably say I've almost recovered emotionally from having to leave the Quilt Symposium of Alabama. It was hard to go back to work last Monday after having so much fun in Birmingham. 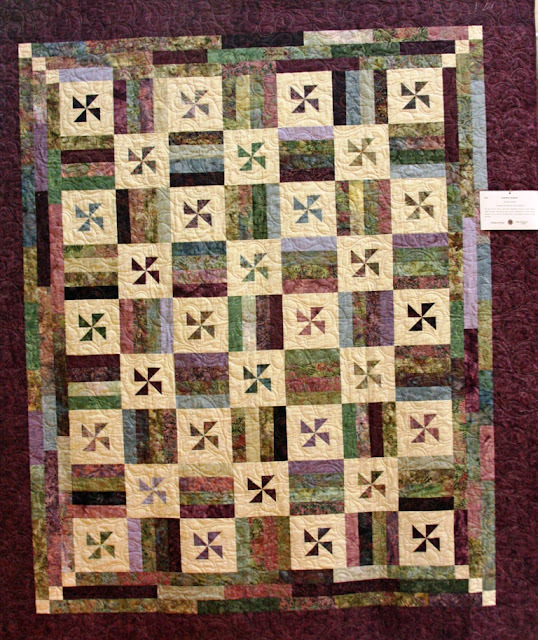 The Symposium was hosted by the Evening Star Quilt Guild, and they did such an amazing job putting everything together. The quilt show was excellent, I wanted to buy everything in the vendor mall, and I had so much fun in the classroom. 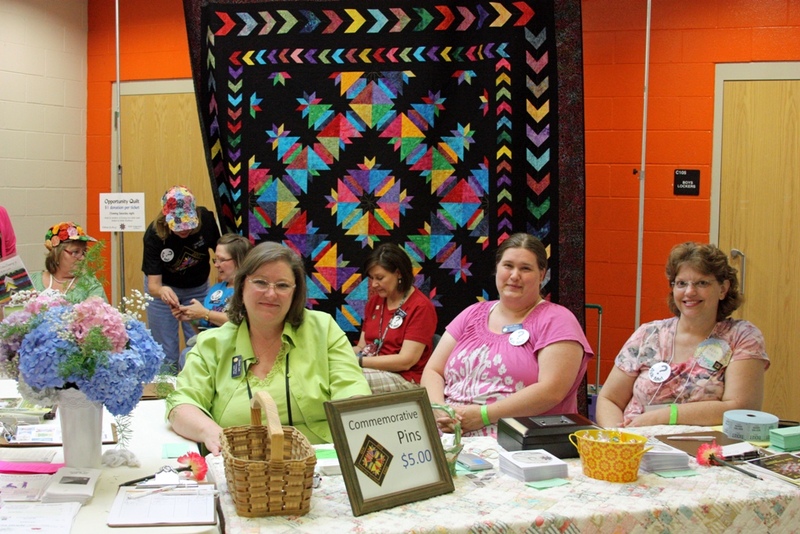 Even though hosting an event that big was an enormous job, the Evening Star folks made it seem like quilting fairies put everything together by magic. No worried looks, no swearing, no crying -- just smiling faces everywhere. These are a couple of my favorite smiling faces. Terry on the right (my "boss") was the event coordinator. At least I hope she was, because people were always asking her for stuff. 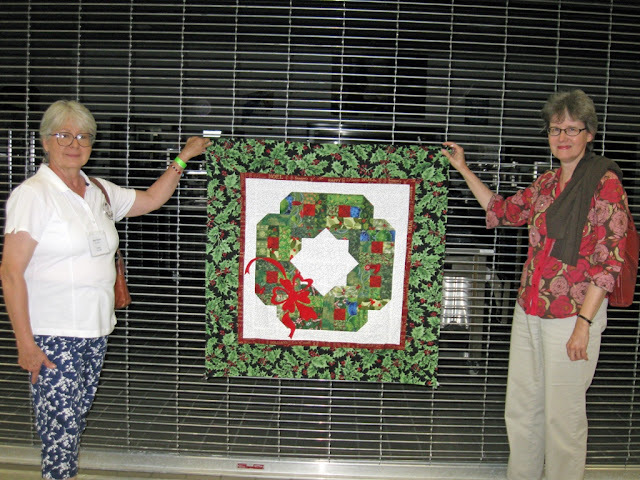 Mary on the left is Terry's sister, a non-quilter, who volunteered to help with the Symposium. I wonder if she knew what she was getting into. :-) She must have walked 8,000 miles. These three (Beverly, Ella, and Sandra) always looked like they were having way too much fun. They sure made me giggle. And check out those yo-yo hats. Adorable, right? Yes, it took this many people to guard the opportunity quilt so I wouldn't run off with it. It was fabulous! It was really cool to meet a fellow blogger, Lisa (right). She's adorable! She's helping Judy hold up a quilt that Judy made using the Over and Under pattern from my book. Judy made only a quarter of the blocks, added red "berries" and a bow, and it looks like a beautiful Christmas wreath! Unfortunately, my photography skills are terrible, but trust me when I tell you this was really pretty. 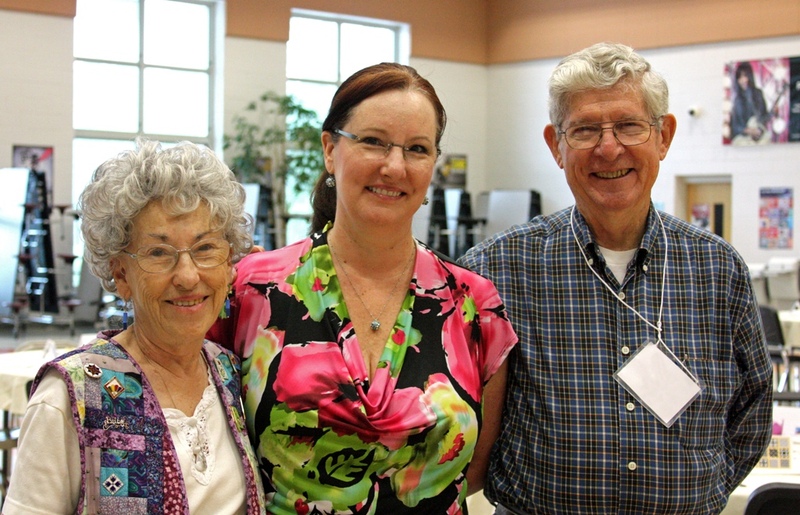 Here's a whole family of quilters -- Betsy, Suzie, and Gary. Betsy was in one of my classes. What a sweetheart. And a mess. She kept me in stitches. Pardon the pun. 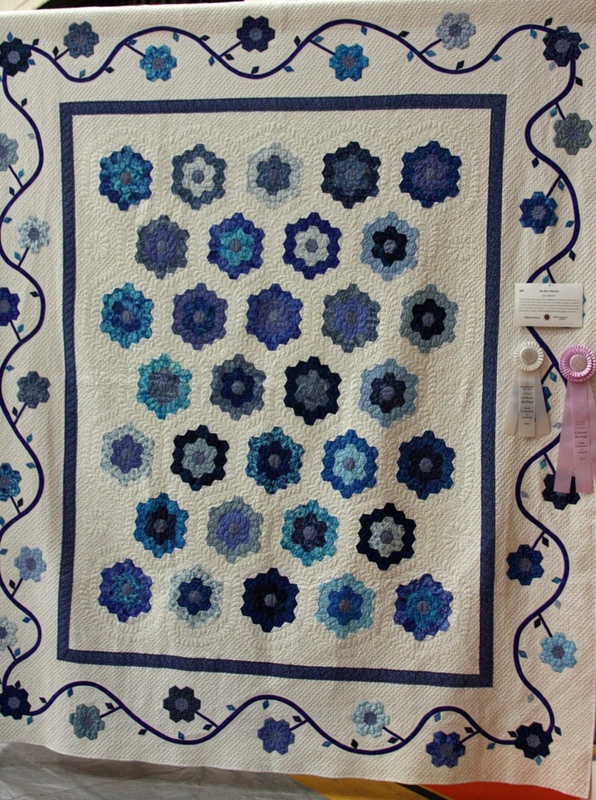 Gary won awards for his hand quilting, including the Judge's Choice award. They're such sweet people, and I wanted to bring them home with me. Here are pictures of one of Gary's award-winning quilts, My Blue Heaven. 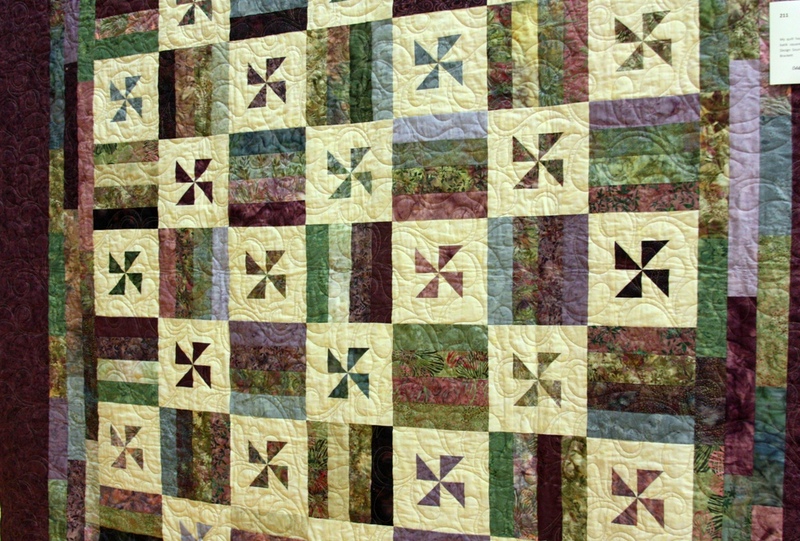 Can you believe all the stitches in this quilt?! It's easy to see why it's adorned with ribbons. I squealed when I walked into the quilt show and saw a quilt made from my Summer Breeze pattern. It's such a lovely version made with batik fabrics and an extra border. I later discovered that it was made by one of my students, Shirley. And of course I squealed again when I found out it was her first quilt! 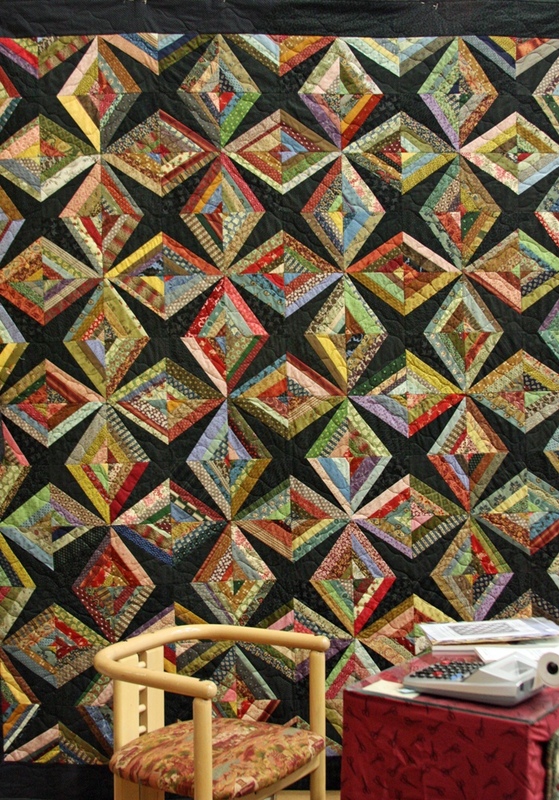 I couldn't take my eyes off this quilt, so I had to buy the book. So many great ideas for string quilts. And so many more to add to my bucket list. What fun! Gary is one amazing quilter!!! Shirley's very first quilt is stunning. That is the most awesome string quilt I've seen and so different. What fun you had! After attending my first quilt show this year I can understand better how you must be feeling: tired, but wishing for more! What beautiful quilts. I especially love the Summer Breeze Batik. What an amazing "first" quilt. thanks for sharing these beautiful quilts with us. Can you send me your email, I want to send you a pic of one of your quilts I Made for a raffle. Love your patterns. Looks like you had a great time! It's always so hard to get back to reality after an experience like that. Makes you want to stay immersed in quilting. 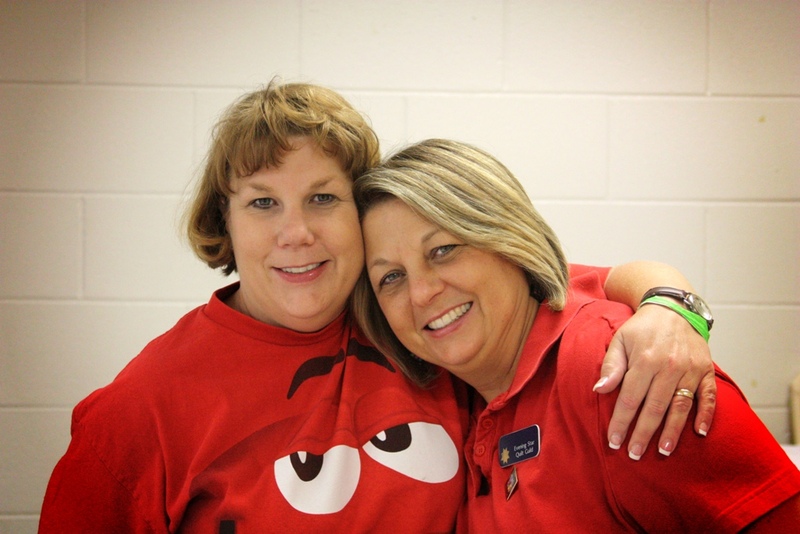 Kim, you were a blast to have at the Symposium! I hope we meet again soon! Rena N.
Looks like you had a great time. I might have to purchase the string quilt book, that quilt is great. Sounds like you had a wonderful time. And looks like Gary is giving his wife a run for her money LOL!!! 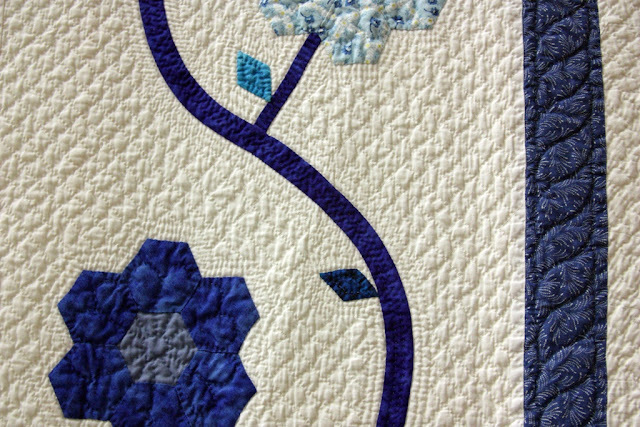 Oh, that Summer Breeze quilt is great. And her first quilt! Wow! I love that string quilt, too. I will have to check out that book! Thanks for the lead. Nice to "see" you again! So nice to see you're back! I can't take my eyes off that black string quilt either. What's the name of the book you bought? I loved going to the quilt show with you!!!! I mean, here on your post of course!!! I am in love with Summer Breeze and perhaps even Gary! Seriously, Summer Breeze is gorgeous. Thanks for letting me stop by.